Source: World Health Organization, UNICEF, United Nations Population Fund and The World Bank, Trends in Maternal Mortality: 1990 to 2015, WHO, Geneva, 2015. The number of women and girls who died each year from complications of pregnancy and childbirth declined from 532,000 in 1990 to 303,000 in 2015. These improvements are particularly remarkable in light of rapid population growth in many of the countries where maternal deaths are highest. Still, over 800 women are dying each day from complications in pregnancy and childbirth. And for every woman who dies, approximately 20 others suffer serious injuries, infections or disabilities. Almost all maternal deaths (99 per cent) occur in developing regions. Two regions, sub-Saharan Africa and South Asia, account for 88 per cent of maternal deaths worldwide. Sub-Saharan Africans suffer from the highest maternal mortality ratio – 546 maternal deaths per 100,000 live births, or 201,000 maternal deaths a year. This is two thirds (66 per cent) of all maternal deaths per year worldwide. South Asia follows, with a maternal mortality ratio of 182, or 66,000 maternal deaths a year, accounting for 22 per cent of the global total. Furthermore, regional and global averages tend to mask large disparities both within and between countries. Haemorrhage remains the leading cause of maternal mortality, accounting for over one quarter (27 per cent) of deaths. Similar proportion of maternal deaths were caused indirectly by pre-existing medical conditions aggravated by the pregnancy. Hypertensive disorders of pregnancy, especially eclampsia, as well as sepsis, embolism and complications of unsafe abortion also claim a substantial number of lives. The complications leading to maternal death can occur without warning at any time during pregnancy and childbirth. Most maternal deaths can be prevented if births are attended by skilled health personnel – doctors, nurses or midwives – who are regularly supervised, have the proper equipment and supplies, and can refer women in a timely manner to emergency obstetric care when complications are diagnosed. Complications require prompt access to quality obstetric services equipped with life-saving drugs, including antibiotics, and the ability to provide blood transfusions needed to perform Caesarean sections or other surgical interventions. Nearly all (99 per cent) of abortion deaths are due to unsafe abortions. **This category includes deaths due to obstructed labour or anaemia. Source: Source: Say L et al. 2014. The lifetime risk of maternal death is the probability that a 15-year-old girl will die from complications of pregnancy or childbirth over her lifetime; it takes into account both the maternal mortality ratio and the total fertility rate (average number of births per woman during her reproductive years under current age-specific fertility rates). Thus, in a high-fertility setting, a woman faces the risk of maternal death multiple times, and her lifetime risk of death will be higher than in a low-fertility setting. Similar to maternal mortality ratio, the lifetime risk of maternal death varies largely across countries. In 2015, the lifetime risk of maternal death in low income countries as a whole was 1 in 41, compared to 1 in 3,300 in high-income countries. Among regions, women in sub-Saharan Africa face the highest lifetime risk (1 in 36), followed by South Asia (1 in 200). *Income groups refer to World Bank income classification in 2015. Source: WHO, UNICEF, UNFPA and The World Bank, Trends in Maternal Mortality: 1990 to 2015, WHO, Geneva, 2015. AbouZahr, C., and T. Wardlaw, ‘Maternal Mortality at the End of the Decade: What signs of progress?’, Bulletin of the World Health Organization, vol. 79, no. 6, 2001, pp. 561─573. Khan, Khalid S., et al., ‘WHO Analysis of Causes of Maternal Death: A systematic review’, Lancet, vol. 367, no. 9516, 1 April 2006, pp. 1066─1074. Say L et al., ‘Global causes of maternal death: a WHO systematic analysis’ Lancet Global Health. http://dx.doi.org/10.1016/S2214-109X(14)70227-X, May 6, 2014. 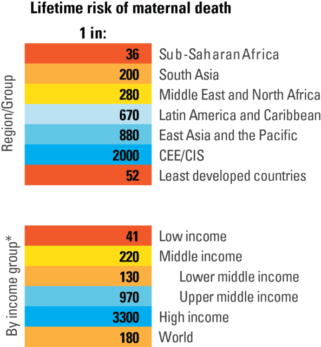 UNICEF, Progress for Children: Achieving the MDGs with equity, Report No. 9, UNICEF, New York, 2011. UNICEF, Progress for Children: A report card on maternal mortality, Report No. 7, UNICEF, New York, 2008. UNICEF, WHO and UNFPA, Guidelines for Monitoring the Availability and Use of Obstetric Services, UNICEF, New York, 1997.
WHO and UNICEF, The Sisterhood Method for Estimating Maternal Mortality: Guidance notes for potential users, WHO, Geneva 1997.
WHO, UNICEF, UNFPA and The World Bank, Trends in Maternal Mortality: 1990 to 2015, WHO, Geneva, 2015. Definition: The maternal mortality ratio (MMR) is defined as the number of maternal deaths during a given time period per 100,000 live births during the same time period. It depicts the risk of maternal death relative to the number of live births and essentially captures the risk of death in a single pregnancy or a single live birth. 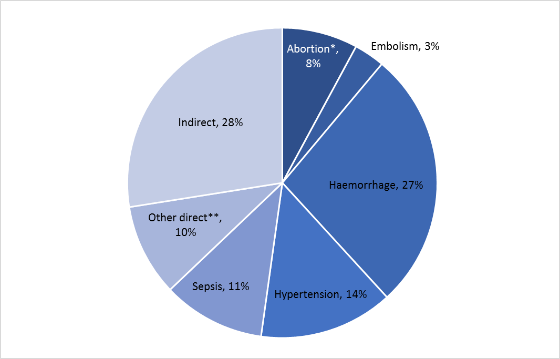 Maternal deaths: The annual number of female deaths from any cause related to or aggravated by pregnancy or its management (excluding accidental or incidental causes) during pregnancy and childbirth or within 42 days of termination of pregnancy, irrespective of the duration and site of the pregnancy, expressed per 100,000 live births, for a specified time period. Rationale: All maternal mortality indicators derived from the 2015 estimation round include a point-estimate and an 80% uncertainty interval (UI). For those indicators where only point-estimates are reported in the text or tables, UIs can be obtained from supplementary material online (http://www.who.int/reproductivehealth/publications/monitoring/maternal-mortality-2015/en/). Both point-estimates and 80% UIs should be taken into account when assessing estimates. For example: The estimated 2015 global MMR is 216 (UI 207 to 249) This means: • The point-estimate is 216 and the 80% uncertainty interval ranges 207 to 249. • There is a 50% chance that the true 2015 global MMR lies above 216, and a 50% chance that the true value lies below 216. • There is an 80% chance that the true 2015 global MMR lies between 207 and 249. • There is still a 10% chance that the true 2015 global MMR lies above 249, and a 10% chance that the true value lies below 207. Other accurate interpretations include: • We are 90% certain that the true 2015 global MMR is at least 207. • We are 90% certain that the true 2015 global MMR is 249 or less. The amount of data available for estimating an indicator and the quality of that data determine the width of an indicator’s UI. As data availability and quality improve, the certainty increases that an indicator’s true value lies close to the point-estimate. For more information on the metadata please visit SDG metadata. The profiles below detail the new round of estimates developed by WHO, UNICEF, UNFPA, World Bank Group and the United Nations Population Division for the years 1990-2015. 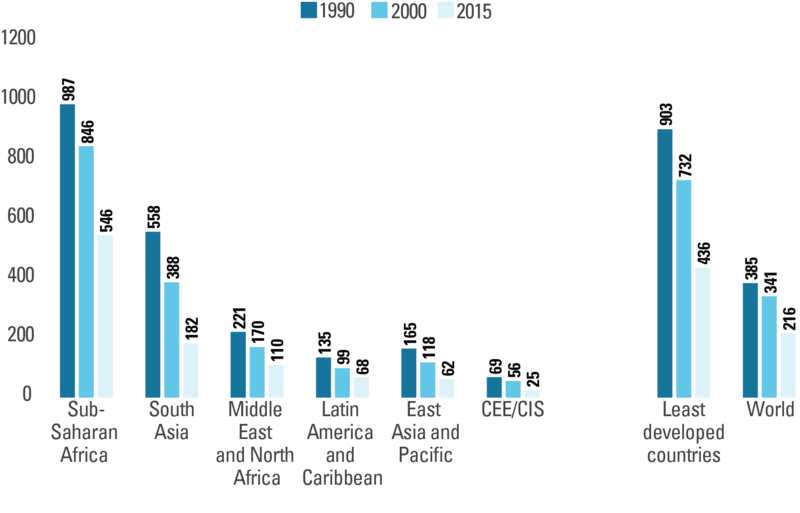 For further information visit, Trends in maternal mortality: 1990–2015.